They will mug me for sure, and yes, t takes some getting used to civilization, …and trees. I also have the hardest time convincing myself that I can just walk outside, no need for a coat and gloves. oh noooooooooooo you went to the city?!?! when will you be back?!?! Ha! that’s true. I can’t sing. I’ll be back up there sometime in early July. What a difference between winter-land & Denver. Brr… on all that ice & snow. But – the sun looks amazing. I don’t think I’ve ever seen that before. Yeah, it;s nice to be in green territory for a change, and trees! But I do miss some things about the arctic, not the least of them being the light tricks. I just love that I can travel, virtually, to somewhere via your pics and words. Thanks! Enjoy CO. Check out Golden City Brewery if your’re near Golden. Any interesting summer travels planned? Oh I will head by the brewery for sure. I may try and get out a little from time to time, and I have to stop by Las Vegas before heading back North, but no specific plans as yet. Seems you’ve arrived here in Denver just in time.. it’s been a snowy spring. Supposed to be nice here all after a day of rain tomorrow…. Hope you have a great time while you’re here! I fully intend to enjoy your good city. And I love the weather, which is about as hot as I care to deal with already. Thanks for stopping by my blog! Enjoyed your blog, will stop by often. Thank you, Thadeus. Glad to make your acquaintance. When I visited Denver last summer I walked in Washington Park while a storm was blowing in…very enjoyable. Good places to eat near there, too. I like Denver…and cats…and cameras, tho I don’t always carry mine with me either. ok, I have to ask Dan, what do you do for work up in Barrow? What brings you up there? I so enjoy hearing your Arctic stories. The first time i see an ice-bow even if it is just virtual. You showed the contrast between the city and the ocean. The beach is your home? These ‘encounters’ are one of the fun things of the internet. Great. 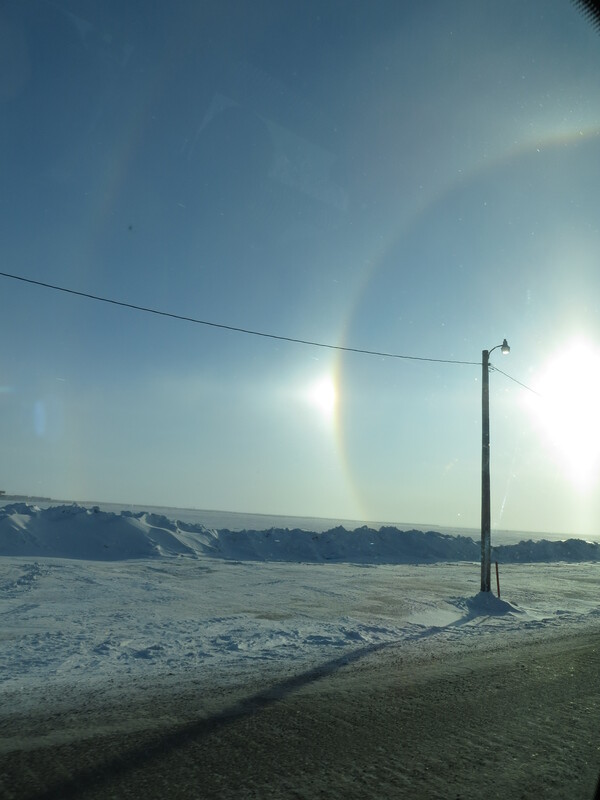 Loved sun-dogs…. as well as the native story about them guiding the sun across the sky. Was fortunate enough to live in Alaska for a while…. magnificent place. Thank you for the photos – it was a great reminder about how the light there is different from the light anywhere else I’ve ever seen! Your cats are fabulous, oh, so are your photographs. They made me cold, just looking at them. And looking at them is as close as I ever want to get to all that snow and ice. Brrrrrrrr. Have fun in Denver.